History hangs on tiny chances. In the last 3 days Arvind Kejriwal blew his chances. They say never write off a politician but AK was never a politician. He was and is a street-thug parading in the mask of a politician as we shall see. I have written this long back and it’s worth recalling frequently: “My favourite line for deceivers has been “the mask and make-up of Chachi 420 wasn’t meant to last forever”. This mask and make-up is now peeling away faster than expected. I doubt AK ever wanted to be a CM. He probably wanted to create a revolution and be a high authority like a Lokpal or a CJI (He can’t be CJI though) or the CIC by which he could dispense instant justice, haul anyone before his court and sentence anyone without proper hearing. He wants to play Dirty Harry”. The other objective currently is to get a few seats in LS and dictate terms to everyone else. That’s right, this guy thinks he’s such a super authority that he can rush in like a storm-trooper anywhere, agitate and do dharnas anywhere and even think he is Kejri Almighty that CMs must give him audience at the drop of his topi. Let’s get past this nonsense of AAP and Arvind Kejriwal’s Gujarat drama first. The text and pic in the red box is a comment which exposes the fact that the pic was from an assault on some journalist in J&K. Certainly, these AAPtards must be worse than morons if they wanted people to believe that the police handling AK in Gujarat were riot-squads in helmets. Besides, AK was halted near a highway and not inside a town with small streets and closed shops. These are the lies that AK and his goons have been peddling all along. AK’s team even broke the windshield of their own car to play victim and blame others of violence. Then on March 7, frustrated at not finding much to crib about in Gujarat, AK tried to bulldoze his way into the CM’s office in Gandhinagar with a list of questions. Naturally, the demand for a meeting was denied. The CM is not obligated to meet thugs who believe they can barge into the CM’s office anytime they want. Not one single news channel called this behaviour wrong. Not one! 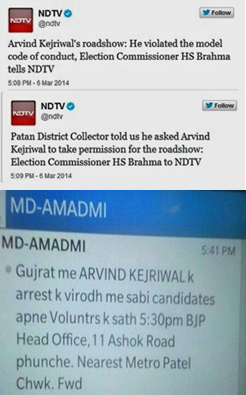 On the contrary there are morons at NDTV and CNN-IBN asking why Modi couldn’t meet AK. This and other incidents of street-goondaism by AK, Ashutosh, Shazia, his goons like Somnath Bharti and others end any claim of being a political party. It is now clear they have only ONE agenda: DISRUPT INDIA. Who sponsors this agenda, who are AK’s handlers will come to public light in due course of time. But as far as I am concerned they are no more a valid political outfit. To top off hypocrisies AK flew from Jaipur to Delhi on March 7 in a private jet (pic of the aircraft model used) claiming no other flight was available (which doesn’t appear to be true). A man who has been asking others about private jets not only takes a joyride in a private jet but it’s also paid for by the media group India Today. The nonchalance in these hypocrisies by Kejri Almighty is simply stunning. Greater moral and financial corruption and hypocrisy cannot be found in political circles. AK’s bogus claims on Gujarat are not even worth talking about. 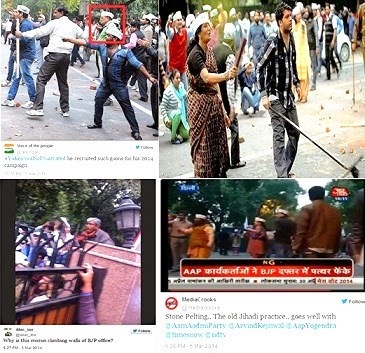 His AAP member Meera Sanyal’s tweets of the last 2 years put paid to his lies. And that is that! Like I stated earlier, AK and AAP are no more a valid political party for me. They are a bunch of mercenaries with an agenda which largely seems to be to stop Narendra Modi becoming PM and generally disrupting India. It reminds me of Quentin Tarantino’s “Reservoir Dogs” (Naturally, remade in Bollywood as “Kaante”). 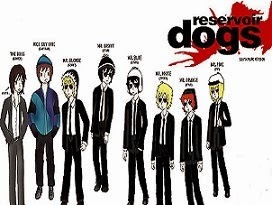 Reservoir Dogs is the story of six criminals given the assignment of stealing diamonds. But the story is not about the robbery, it’s about what the six criminals do before and after the robbery and how they interact with each other and others outside their group. As time passes the distrust grows between each other and a cop runs into them as well. The movie has one of the most viciously violent scenes where one of the criminals chops off the cop’s ear while rocking to the gentle strain of a song. In the end they kill each other and only one gets away. The story of AK, his sidekicks and AAP is a story before and after becoming a political party and becoming MLAs. The before story is that of an anti-corruption crusader and the after story is that of pathetic lumpens. The audience voted on AK’s discussions and a majority did not see him as a politician. That is what I said in the beginning, AK is a street-thug parading as a politician. Remember, at such gatherings audiences are generally kind to the guest, as they should be. But I doubt anyone sees AK as a serious politician or AAP as a serious political party anymore. Their leaders are reservoir dogs who are on an agenda as explained before. Time will tell what exactly the agenda was, who is sponsoring it and who is funding it. Because it sure doesn’t look like these guys care for India going by their policies on Naxals, Maoists, Kashmir and many other issues. That apart, they don’t seem to have any political vision or economic vision. The only skill these reservoir dogs seem to possess is to agitate, cause violence, insult everyone else and bark loudly calling everyone else corrupt. That drama-sale reached an end on March 7. It won’t sell anymore. As the elections near, we should not lose focus on the main goal which is to see NaMo as PM. Arvind Kejriwal and other disruptive elements are trying hard to take our focus away. If they are not ignored they tend to dominate our minds. But how do we ignore? By understanding. By knowledge. It is in this area that SM esp. 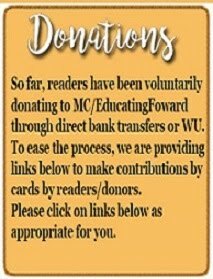 blogs like MC help. Kudos to another excellent piece. Its another Good piece by @mediacrooks on pathological liars i.e AAP.which dey have only one agenda to stop India from growing and became prosperous. The one thing this crazywall & co along with their rogues in media are doing is take away any attention from Rahul/Sonia & at the same time Crazywall & co are successfully doing the job of Digvijay Singh/Kapil Sibal/Manish Tiwari. At India today conclave Diggy & Manish Sisodia literally ganged up against Amit Shah. Even the usually friendly to AAP Rahul Kanwal couldn't resist remarking that Diggy & Sisodia are ganging up against Amit Shah. No matter what, Modi shouldn't pay any attention to these street thugs, which is what AK & his motley crew are trying to achieve. Not withstanding the antics of the AAP morons, one must admit that a lot of technicalities have been deliberately built into our systems to safeguard corrupt politicians.AAP is aiming to bust these castles, though the methods are questionable. For eg Accepting or offering bribe is a crime. Here the act of offering bribe is made a cognisible offence, so that aam aadmi does not muster the courage to proceed against the one who demands it.One can see umpteen examples of such built in safeguards for the corrupt. Of course. But the way to do that is to simplify the rules of doing business and cut red tape. Not by street dog behaviour adopted by AK and his hooligans. Brilliant Ravinar. It is funny to see many people still believing in Kujliwala. They are the low IQ ones. Anyway, I don't think they will win more than few seats in LS. In 2010, Tamil movie director K.V.Anand made a movie called 'Ko'. The story is about a young man disillusioned with the system, starts a political outfit with other youngsters to bring about a change. People desperately looking for a change start inching towards the party and soon the party makes a lot of noise and gains massive publicity, thanks to friends in media. In one of the major rallies, there is even an assassination attempt on the young leader by blowing up a bomb. After winning the elections with a thumping victory, the young leader becomes CM. In the meantime, while the assassination attempt is being investigated, they come to know that the bomb was triggered by none other than the young leader himself. It was all a BIG drama to gain sympathy. The young leader and his coterie were all Naxalites masquerading as social activists. Story sounds familiar? This movie was made way before kujliwala came into the picture. 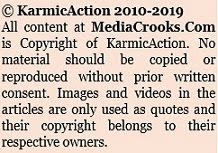 So media and congress is continuing with its propaganda against BJP and Modi 13 years running !!!!! Whilst for people like us , there is zero credibility ( and even negative perception ) of AAP and AK, I hope there are little or no supporters of AAP/ believers in AAP amongst the 500 million media addicts in India . Otherwise once again it will be satyameva parajitay !!! And to add insult to injury , if they are successful in stopping Namo - then India will have to suffer a Maya , jaya, kejri, mamta or another devegowda kind of PM and the whole of India and Indians will deserve their fate !!!!! ( for not doing the right and not doing enough to stem the evil ). Thanks for summing up the Kejriwal phenomenon. This elections will have lasting impact on India and what will remain of India. Ever since we opened up markets in liberalization move we were losing bit of India and our Indian-ness. The agents of capitalism does not want left to have a say and Islamic forces does not want right to stay in power. These are the two most powerful forces within and outside India. Congrsa fits the bill easily they neither left nor right, easy to buyout and centrally controlled with zero democratic ways of working. Ak's sole focus is to divert the attention from the mega scams of CON party and focus on Modi's claims. His claim of AAP not being a CON party B team is to be ignored in totality. He didn't go and agitate in front of the UPA ministers residences or in front of the PMO for all the scams they have indulged in, he hasn't raised one question to Anthony regarding what's happening in the Navy for the past one year. None of us here believe what Modi claims is 100% true but we are pretty sure its atleast 80% true. No one can eliminate poverty 100% or provide amenities to 100% of the population in India. Even in yesterday's conclave AK himself says if corruption comes down by 80% it is an achievement then why different yardsticks for Modi. No need for Modi to give him an audience and give him the publicity he craves for. Kejriwal doesn't have any work to do but NaMo has lot of work to do for the next 2 months. So he need not be accommodated. Let AK visit other states like WB & TN and try to meet the CM's in this manner and then we will see what happens. Since he has confessed to be an anarchist he should be treated like one. I feel sorry for the millions of consumers of MSM who still believe this street dog is some kind of a messiah. I was particularly disturbed by AK's comment at the IT conclave. Somebody asked him to make a positive suggestion as to who should be the next PM. This creature declared that this Lok Sabha will be a fractured one. Imagine the evil of this man...India can ill-afford a fractured mandate at this time. An instead of working towards a better alternative, this man happily states that India will be a mess. Very rarely do we encounter real evil...it resides in Kejriwal. Based on your input some how I could draw corelation between t AK of India and Zaid Hamid of Pak (I hope you have come across this chap in youtube or google). Both these folks always quote we are doomed, albeit Zaid Hamid is more dramatic than AK!!! meethi churi se kiya halaal - that's what neeraj kumar did to kejriwal and his backers india today. the rest may well have been silence. The only true words spoken by Kejriwal in recent time - " Mein Bahut Chota Aadmi Hoon...Mera Aukad Kya Hai ? " The irony is AK fooled everyone from IAC days it is unfortunate Media gives 24/7 attention to someone who wants to destabilise India.Very well articulated write up! Now China and some south-east asian nations are major manufacturing hub of the world. Everyone is watching how it has impacted western monopoly in this sector and overall economy of them. Just imagine what will happen if India starts to manufacture almost everything India imports. And, India has that capability.Even India can reduce import bill substantially through her own natural resources of oil & gas and renewable energy. But here also the same game. If you search for those who are exporting to India and what, you will start to realise how and why these things are happening here. And they are doing it for for a long long time by creating political parties,NGOs, activists and of course with total control on MSM. Funding and keeping points man in different part of our system, not a problem in India as there is plenty of our 'own people' who assist them. Different routes have been made available by our finance ministry so that black money can flourish and utilised for the above mentioned purpose. So far they have successfully kept India divided through caste,religion. For the first time, last assembly election in four major states has shown a different trend. And, this actually has started to destroy their age old calculations. As per Karan Thapar,"Modi is the agent of this change.....". So naturally he is their main target. On November 24, 2009, Michaele and Tareq Salahi, from Virginia, and Carlos Allen, from Washington D.C., independently gate-crashed the state dinner between President Barack Obama and Indian Prime Minister Manmohan Singh. Michaele Salahi is a member of Bravo's The Real Housewives of Washington, D.C., and the show filmed their preparations for the dinner and followed the couple to the White House. Tim Burke, who directed MTV Blaggers!, in which a group of friends gatecrash high-profile events and parties, said he was contacted by Salahi a week before the White House incident. Salahi asked him for advice on tricking his way into a black-tie event. I don’t see any difference between the Bravo’s reality show and Arvinds Kejariwal’s gate crashing in Modi’s office, but more similarities. 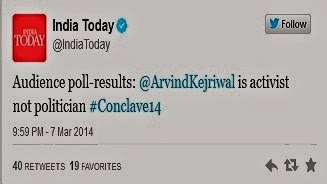 Y'day, at India Today conclave, did we miss an important point which Kejri made. He said,"In Gujarat, the opposition is non-existent. Its members are threatened, coerced into submission or even killed." Though a person from audience asked who was bought recently, AK mentioned some ministers name, fine. But nobody asked 'Who was killed from opposition because he didn't agree to change the party'? Actually, I feel BJPGujarat should seek answer from KejriTheNautanki. Or did he pass on a hint that what AAP is going to do next. Afterall, elimination of opposition is what these f...tard communists do. Thats their expertise and niche segment. 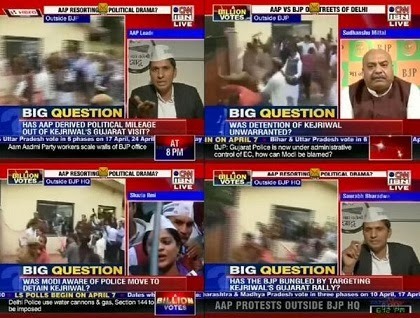 My anguish is why is there only Ravinar who fights these anarchists but the influential media promotes his AAP anarchy? Don't MSM realize that Keriwal is a bigger threat to the unity of India? Most of MSM crooks are also danger for unity of India and they are hand in glove with some anti national elements. That biting commentary of Neeraj Kumar is telling! It summarizes what you have expressed so nicely in this piece. Thank you, Ravinar. I seriously wish someone takes care of these Bogus media groups when Modi becomes the PM. If lying is a sin / crime, then these Media houses are Messengers of Hell. Why should not the EC dissolve AAP ? Of course, these morons will should that Ambani pays the EC too and the MSM idiots will sponsor and market that mid-night masala too. Somehow, i want BJP to field RAKHI SAWANT against AK , in this LS, and WIN. Excellent write-up. Now Im think AK is a spent force. He and his party will fade shorlty. AK is a motormouth and he will spill the beans shortly knowingly or unknowingly who his handlers are. 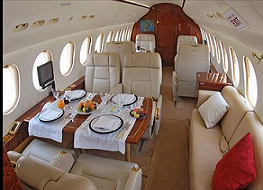 For a change yeserday Arnab was aking an Aaptard why Ak travelled in a chartered jet when he asks others the same. That person was side-stepping the issue. Now people have understood the game plan AAP and they dont get carried away. AK is not a politician - rather an activist. He would like to usher Arab Spring in India. What disturbs me is - I am surrounded by highly educated people, aged between 20-30. And most of them are AAP - supporters. They believe everything what AK says. Please note these people are, otherwise, have a high IQ. It appears that there is a strong disconnect somewhere. These young guys do not know the history of political India and so it is easier for them to get carried away by an apparent good political speech. But the most important point is - they feel that they are unable to reach their deserving place due to a malaise in Indian System where meritocracy is subservient to "connections" and money power. If IIT graduates, working for a PSU may feel so, you can assume what other less privileged persons will feel. Neither I have seen any political parties (other than AAP) to connect this group in any meaningful way. Neither these youth can correlate with any of the leaders of Congress or BJP. There is an ocean of discontentment in today's society. Either you tap it for positive purpose. Or it will get used by someone for a destructive purpose. And you need some leaders of young age whom they can correlate. Like in our days in 1996-2004, we felt listening to Pramod Mahajan. Mr Unknown and other people on Mediacrooks are totally nonplussed by AK's receptivity among those that should be a natural Modi constituency: the highly educated from India elite institutions. Problem is that these people have highly analytical minds and can put two and two together. You need not know the political history of India to know that the Nira Radia-type crony capitalism cannot yield high growth rates. Any society that rewards Radia type networking over merit is doomed to face the crisis that India is going through right now. And this is NOT just because of an Italian conspiracy and pseudo seculars - although the latter are past their sell by date. Even if he does not pocket crores like his peers, Modi cannot take a stand on certain issues like who is funding his party because that will expose the muck that lies underneath India's political system. So someone is paying for the rallies and planes. Who are they? India's political parties are not supported by their members through dues but by business houses big and small who need to cultivate contacts in the state. Yes, and this includes the communist parties. That is just a fact. I had written a comment on this blog about Arvind Kejriwal in 2012 (see below) when Modi fans had just begun propagating their Ford Foundation-foreign hand conspiracy theories about him. After reading this post, I fear that the passage of time has further strengthened those beliefs. In this post, I read a lot of old hand wringing about the foreign hand supporting AK and co. to create “disruption” in India. I am sory but I think Indians are doing a very good job of doing that on their own. Its all Swadeshi. I had said in 2012 that even if Arvind’s party gets 0 seats in Delhi assembly elections, BJP/Modi better take a clear stand on the issues he is raising because he and his so-called AAPtards will continue to be problem for whoever is in power beyond 2014. Fakeriwal is the proxy for that embodiment of evil SG. I always used to think that IG was the epitome of evil. But, even IG pales into insignificance as compared to this epitome of evil called SG. She knows that her days at the helm are coming to an end . The days of power without any accountability are fast coming to and end. And she very well know that she will face the hell if the contender becomes the PM becuase he will not be soft towards her as in the case of ABV with who somehow this devil extracted the maximum. NM will not only put her entire family behind bars but confisacte much of the ill-gotten wealth. She knows very well that she wiped out politically this time as the people are no longer in a mood to buy her stories. So, she created this proxy and with the aid of her friendly media dogs have propped up this snake. Otherwise, whcih other politician would have got this much of media space and time especially when he has ran away from responsibility. From where he is getting so much of funding ? Who will donate to this joker? It is all that red money sucked out by this demon from the India public being sent back as donation thro' Foreign foundations. He is the mask for the epitome of evil SG.. period . If people of this country are not able to see this , they are doomed for ever. your comment is a perfect articulation of ground thoughts at large ... people are just waiting for a solid opportunity and proof that provides the linkage between Cong high command and AAP. I see people are waiting for some one to save this country.I am positive Modi will do something better for governance. Are there any folks also want to team up and actually do something at grass-root level ? I want to team up and use my leisure to do something. I am interested in public transport, sustainable living, local employment opportunities, community schools... anyone out there who thinks they can participate, lets interact. I understand your sentiment. But also, you must agree that to fix things, you don't just need a decisive leader, you also need people who believe and are ready to bring him to power. The latter is also part of responsible action. Thanks for your response. I am guessing you missed my intent. It is a call for action. I am not talking about bringing Modi to power, though I welcome that. It is to gather a few folks and start a discourse and see if we can *do something* as part of a non-political movement. You might wonder, if this is not a way to do such. All of my limited circle of folks are again, hoping for a messiah and have given up. So, I thought Id' give it a try here. Why did nobody asked question about Meera Sanyal's tweets? Also see Kejriwal retweeting people who are tweeting against Neeraj Kumar...Sulag to gayi hi bhai ki sachchai sun ke. India's fate hangs in balance. Will the forces behind AAP manage to fool India? Unfortunately many people especially women are buying AAP's lies. The crooked media gives non stop publicity and support. If they manage to thwart Modi, India is doomed. It will be reduced to an also ran. A post which is an outcome of pent-up frustration. AAP has been the disrupt-or and is slowly asking questions that the main opposition parties shy away from asking. 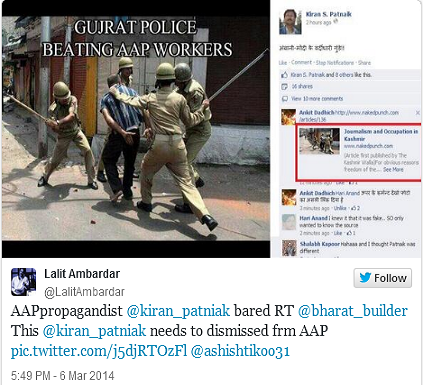 While attacking AAP, the responses typically begin with abuses and terms like AAPTARD. The fact is, AK was never in the calculation of BJP and now they are scrambling to not cede ground and miss their Mission272. Call them "B Team of Cong", abuse them or do what you want, you just can not ignore them. They say any publicity is good publicity. AK understands this better than anyone else. NaMo might act cool and not name AK even once in his rally, but the attacks on AAP Leaders in Gujarat etc betray a fear of the unknown. Today, no one is talking of Rahul, Manmohan or Sonia. And the polarization in the elections is for all to see. Interesting times ahead!! By the way rehearsal of your hero..
What attack ? Please clarify and prove. Arun Puree has done a great job. He deserves a full blog from Media crooks. I have a feeling that Aaj Talk and Arun Puri have been denied justice which they deserve. Let AK do whatever he wants in Gujarat, UP, MP , Bihar, and Rajasthan...he can only cut congress votes or the so called secular party , so BJP can easily sail through these states. But BJP must worry about TN, Kerala, AP, Orissa, WB and Karnataka. TN already alliance lined up, may be good friend Rajni should be asked canvass for BJP, who knows he might oblige. AP- TDP and TRS both should be taken in to account, one may be pre poll the other one for a post poll. Karnataka already Yeddy in, may be some big financial people like Mohadas pai, Kiran Majumdhar, some film folks, writers, NGOs should have unleashed everyday. Orissa , I don;'t know really what can be done, but some thing need to be done, may be visiting villages with TV Van and showing about Gujarat might bring in votes, they need some famous faces as candidate - may be a real youth team can be tried. WB, if there can be split in the Muslim votes between TMC and Left, may be there are good chances for some seats... between these states some sizable seats are required. BJP has to do something... not to worry about these TV shows and Drama. As a start , leaders like Sushma Swaraj ( Is she still in BJP??? ) and other women leaders can go to these states and address as many meetings or gatherings. .
he couldn't give one conclusive answer to any of those questions. and the level of lie he was peddling was epic. surprisingly none of the so called journo present were challenging it. He wants 10 or less seats in LS to make it difficult for the government to function, post June 2014.It is likely that they may not win more than one or two.They are on their way to becoming Medha Patkars,Shabana Azmis, Shabnam Hashmis,Arundhati Roys and many such ambulance chasers, funded by foreigners.After a proper defeat in May, they will disappear ,only to return in 2018 with same agenda. Last week has shown "Development in Gujarat" (courtesy Ms.Sanyal) and "Decay of Indian Education" courtesy AAP. Earlier the common refrain was, politicians are uneducated and hence politics is dirty. After last week's incidents it is conclusively proved that educated people are no better. Education without ethics is more dangerous than a Nuclear bomb. the amount of anarchy these people will spread after elections. BJP should be bold to pit Rakhi against AK, Arun Shorie against YY, Kiran Bedi against MS and ensure that this trinity is stopped from executing their sinister plans. Everything has an expiry date. We can't denigrate these people against viruses like ak, yy, et al. Patience. I realised the same convincing my neighbours as well.. There is a big hypnotised, mislead and brainwashed lot which supports this nautanki party. The good part is their rival lot is much bigger. Your articles are always fantastic. Gives the 360degree analysis of any issue. Plus your wide knowledge. Awesome. The problem is aggravated by lack of competent spokespersons for bjp. Ravinar does an excellent job of shredding AK, AAP and crooks in media . Why are bjp spokespersons not able to do that ?? They can go thru these articles everyday or better still make him as one of their spokespersons ( off course only if ravinar is interested ). There is only a month of campaigning left .and these scoundrels should not be allowed to get away with their lies, incompetence . There ate so many right wing supporters who defend BJP in different websites that can do a better job than the likes of chandan mitra, janardhan vyas, javadekar, nalin kohli et al. Bjp needs to act and act fast. AK is nothing just media hype and media lies . I have remained in the system and fought the system for over three decades . And so are many others . One just should be able to stand up firm and he and the media crooks will shudder in their pants . AAP has successfully painted itself as a party of educated retards (due apologies to born ones). The fact that a few eminent people like Mr Balakrishnan (Infy) and Capt. Gopinath are still in the party suggests that they are risking their hard earned image under due pressure from some quarters. I guess they are same as the AK's handlers mentioned in this article I hope this comes out very soon. A few years back there was a movie called Main Azad Hoon starring AB. Media played a very critical role in promoting character of Azad. I fear AK's story would not end like the the one in the movie. the contactme button on this site is not working, also please enable the message button on your facebook page...that would encourage people to share videos and artifacts. Dear Ravinar - You seem to have forgotten to mention Rahul Kanwal who dared AK to answer about Somnath Bharati's association with a dubious company involved in SPAMS and supplying Domain Names for Pornographic Sites. Any ways, as usual a very good article. "AK’s team even broke the windshield of their own car to play victim and blame others of violence." AK seems like an attention seeking toddler and would go to any lengths to get it. Hence I believed the attack on his windshield was probably done by one of his cronies but found no evidence so far (obviously do not expect the MSM to pursue this case). But your statement sounds like you know for sure. Can you also share evidence for the statement? Thanks.